Adam Eaton no match for Randy Johnson, even when the Big Unit was hitting, and it's yet another rubber game today. Demoting R.J. Swindle for Joe Bisenius. The Phils lead is down to a half game, so need a win and/or a Mets loss to have the lead heading into the All Star Break. Phils with the late inning magic as Chaee Utley starts a rally and they take the series from Arizona and head into All Star break in first. First Place At All-Star Break – Now What? and head into All Star break in first. Just like we will do this year!! Ten years later!! Let things play out this year just like they did 10 years ago. Wonder how the NY fans will react to Chase Utley. AL wins the game so they get home field for the World Series. Of course, if you sweep or split the first two in the AL park, an NL team can still win the Series at home. Word is Brett Myers will be coming back into the rotation in about a week after his demotion to work on things. Another off day for the team, but big news, Phils Acquire Blanton for Cardenas, Outman, and Spencer. Most people hate the trade. Blanton won't add much, it's thought, and Cardenas is looked at as possibly being the next Ryne Sandberg. * Too big a price to pay? At least one poster was thinking postseason after the trade. *Spoiler: He would go on to play for the Cubs, just like Sandberg. However, it was a few cups of coffee in one season and he .183. Outman would pitch for parts of 6 seasons before giving up in 2017. Spencer never made the bigs. Eaton to the bullpen, it's announced. And baseball is back, as Jamie Moyer looks to keep his record perfect vs Florida. Moyer does it again, Phils start the 'unofficial' second half with a win. In first place with a one game lead. Florida rocks Kendrick, but we're still a game up, it's the rubber game, at least we've got Hamels pitching. Ugly hitting and a disappointing loss in Florida. Now tied for first. Ugh. Charlie rips the hitters a little bit. Off day. Jayson Stark still likes the Phils to win the division. Big series with Mets at Shea, the old battle for first aka Who Is The Team To Beat? Billy Wagner going for an MRI. I'm headed to the game, despite the awful pitching matchup, our new bum Blanton vs their ace Santana. Big comeback win at Shea bringing back those '07 vibes. So Taguchi sighting! Now it's up to Brett Myers to keep it up. In other news, Christian Bale is a badboy Batman and the salacious Alicia Lane/Larry Mendte scandal was the big story in PHL. The world ten years ago. It will be another month and two days until the presidential election heats up. Myers/Madson aren't able to stop the Mets, so we've dropped back into a tie for first place. We're even griping about Utley. It's up to Jaime Moyer to keep us in first. JRoll scratched for showing up late, Mets win, Phils drop out of first place for first time since the beginning of June. The schedule eases up some now. Let's see if the Phils can regain their mojo. They have the Braves next, and have gone 8-1 vs them so far in '08. Listless loss for the Phils and they're two games back. Season slipping away. FOX game today. Greg Dobbs with the huge pinch hit homer, ties the club record for pinch hits in a season with 20. Adam Eaton gets a win in relief. Picked up a game on the Mets. Rubber game today. 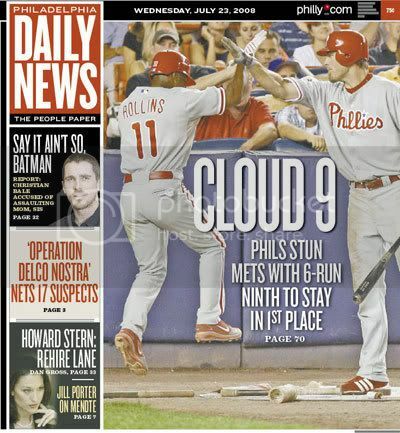 Thunderstorms messed with Blanton's outing, Adam Eaton had to pitch and pitched like Adam Eaton, but Phils offense carries them to a series win to keep pace with the Mets. Today another off day, with news that Eaton will be demoted, about time. Three with the lousy Nats, a chance to make a move on the first place Mets. J.A. Happ recalled to fill the Eaton slot. But Pedro Feliz (bulging disc) is headed to the DL and Mike Cervenek is back too. He was 0-1 in his first cup of coffee earlier in '08. Chase Utley, who is not injured according to his wife, knocks in both runs as Phils take the opener in DC and the Phils move to a half game back of the Mets. Phillie killer in game two though.